i asked ryan what he wanted for lunch on sunday, and of course he had no idea. he grabbed the ipad and started scrolling through my pinterest boards and within a few minutes exclaimed: "how about these sweet potato black bean burgers?!" man after my own heart right there, i'm telling you. 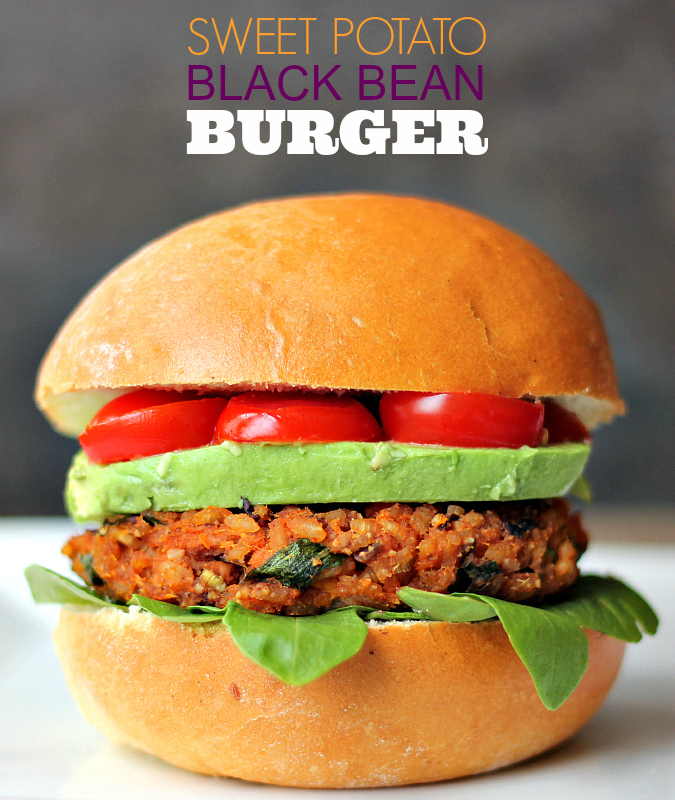 these burgers are loaded with black beans, walnut meal, pecan meal, rice, and some spices. the mashed sweet potatoes act as the glue to hold all of the ingredients together. 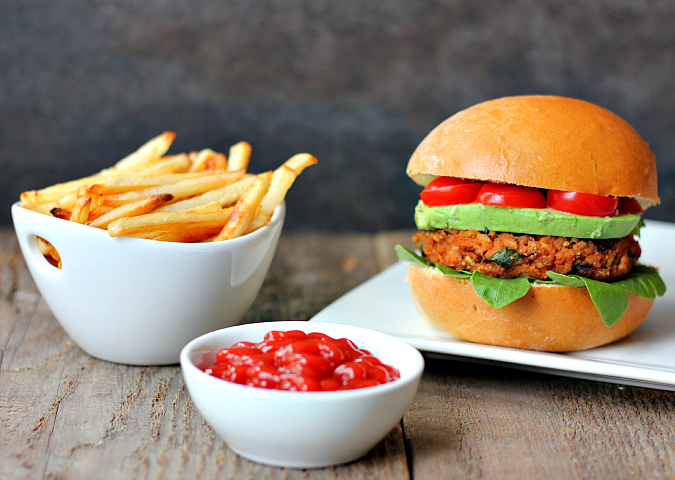 these veggie burgers are vegan and gluten free too (without the roll of course). we served our veggie burgers on fresh brioche rolls with a few mixed greens, sliced avocado, and tomato. they were insanely delicious, and they sure were filling! we made a few homemade french fries to go along with our burgers. after all, some things are just meant to be together like burgers and fries. this recipe made a lot of burger patties, so we left some in the fridge to eat this week and froze the rest. it's so nice knowing that you have things like homemade veggie burgers in the freezer when you need a meal in a pinch! preheat your oven to 400 degrees F. cut the sweet potatoes in half length wise. rub the cut side of the sweet potatoes with olive oil, and place them cut side down on a baking sheet lined with aluminum foil. bake for 30 minutes until tender. meanwhile, combine the rice and the water in a sauce pan. bring to a boil, then reduce the heat to low. cover and let simmer for 20 minutes until the rice is cooked. once cooked, fluff with a fork and set aside. once baked, remove the skins from the sweet potatoes and mash the sweet potatoes along with the black beans. pulse the nuts in a food processor until they are the consistency of nut meal. add the nut meal to the potato and bean mixture, along with the scallions and spices. mix well. add the cooked rice and mix to combine. reduce the oven temperature to 375 degrees F. scoop 1/3 cup amount of the mixture into your hands and roll into a ball. flatten into a patty and place on a baking sheet lined with aluminum foil and greased with olive oil. bake for 35 minutes. Wow, looks like a great tasting burger. I may try that sometime. I bet the sweet potatoes really kick up the flavor.